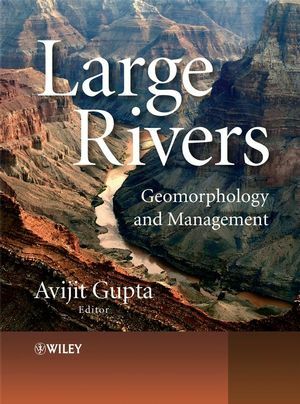 Large Rivers: Geomorphology and Management explores an important topic in geomorphology and sedimentology: the form and function of major rivers. Our knowledge of the big rivers of the world is limited. It is currently difficult to recognise large rivers of the past from relict sedimentary deposits or to structure management policies for long international rivers. This exciting book brings together a set of papers on large rivers of the world, as a unique introduction to a demanding subject. The book includes thirty chapters and is organised into three sections. The first part is on the environmental requirements for creating and maintaining a major river system. The second is a collection of case studies on 14 large rivers from different continents, covering a range of physical environments. The third section includes chapters on the measurement and management of large rivers. Large Rivers: Geomorphology and Management is essential reading for postgraduate students and researchers in fluvial geomorphology, hydrology, sedimentary geology, and river management. It is also of relevance to engineers and environmental consultants in the private and public sectors working on major rivers of the world. Avijit Gupta, School of Geography, University of Leeds, UK, and Visiting Scientist, Centre for Remote Imaging, Sensing and Processing, National University of Singapore.